Indie pop duo Courtship. have today released the music video for their breezy single "Tell Me Tell Me", which Nylon premiered and praised for it's "bright, poppy" aesthetic. 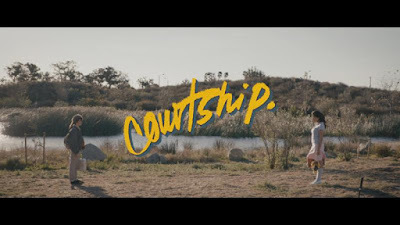 The video features "IT" star Jack Grazer and his girlfriend Ellie in a charming homage to the universe of Wes Anderson's film "Moonrise Kingdom." The track is available on all digital retailers now and will be included on their forthcoming debut album, due out this later spring. The band is currently out on tour with English bands The Hunna and Coasts, before they embark on another U.S. run with Night Riots this June. The Los Angeles two-some recently wrapped up their first ever tours with The Wombats and Passion Pit to stellar reviews. For tickets and a complete list of dates, please see below or visit wearecourtship.com/tour. Comprised of Eli Hirsch [guitar, vocals] and Micah Gordon [keyboard, vocals] - have generated a quick, noticeable splash in the online music community with their funky guitar flavors, shimmering keys, and righteous falsetto-colored hooks. When their first collaboration "Stop For Nothing" was released in 2016, the track lit up popular Spotify playlists such as "A Perfect Day," "It's ALT Good," and "Indie Pop," amassing over 2.7 million streams and counting. Acclaimed early on by Billboard, NME, The Four Oh Five, and more, they landed a major sync as Snapchat chose "Sunroof" to soundtrack a Custom Stories launch campaign.